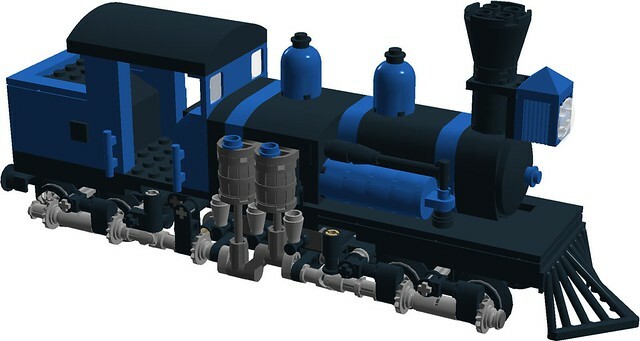 This type of geared type loco is called a "Shay" (specifically a type "A", which means two pistons and two trucks) and were named after their original inventor of the type, Ephraim Shay. These loco's could only go about 20 miles per hour (or about 32 Kilometers per hour, if that's your thing) at top speed, and were very steady on rough track, hauling logging and mining trains up grades that would easily stall conventional steamer types. You can read more about Shay geared steam locomotive's at Wikipedia. Please NOTE: The design of the original Shay I redid into my version was by Stephan Pakbaz over on Flickr, as seen below. (His LDD file allowed me to build my version) as seen here. 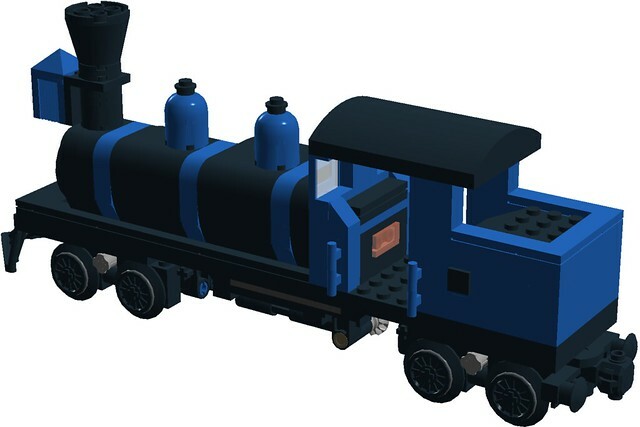 The 1 x 1 tiles on either side of the coal bunker are supposed to be printed with the number "4"
The Shay type only has pistons on one side, with the other side being kinda sparsely decorated. Usually, their would be various accessories and such on this side, but i liked it better devoid of any clutter. The Shay geared steam loco bends in a odd way... but at least it works. NOTE: The angle shown is quite a bit more severe curve than the loco will ever have to handle.... but it looks pretty cool! 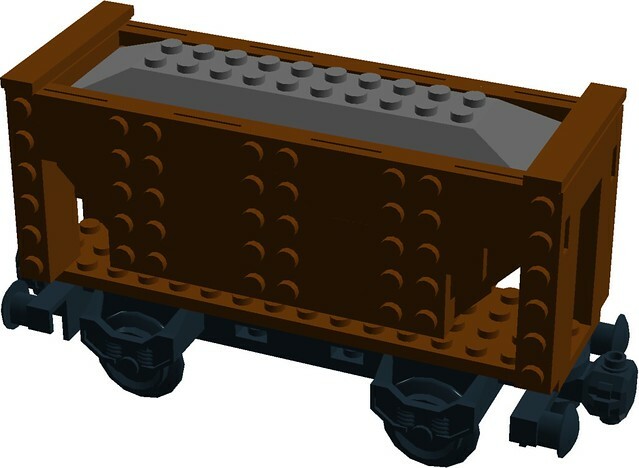 This raw ore car was modeled after a custom Brick Link item by @wildchicken13 except mine is narrower and uses two wheels for a Wild West flair. You can see the original item that inspired me here. 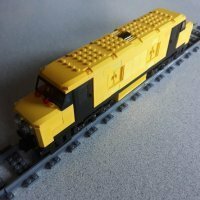 The caboose follows my standard pattern for my Western trains, with only a few color swaps and a missing cupola on top to set it apart from the others. 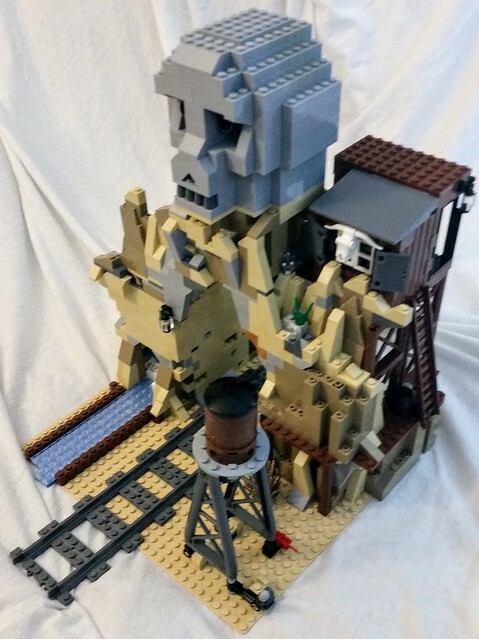 As you may have suspected, the ore the mining train holds comes from my well-protected silver mine, which can be seen in it's own topic. ...and as usual, comments, questions, complaints and suggestions are always welcome! Must say the loco, hopper wagons and caboose look wonderful! Great to get the shay's gearing so well done in 6 wide, presents more of a challenge than wider scales. Look forward to seeing the finished model in brick form, sure it'll look as brilliant in the flesh as the others you've built! 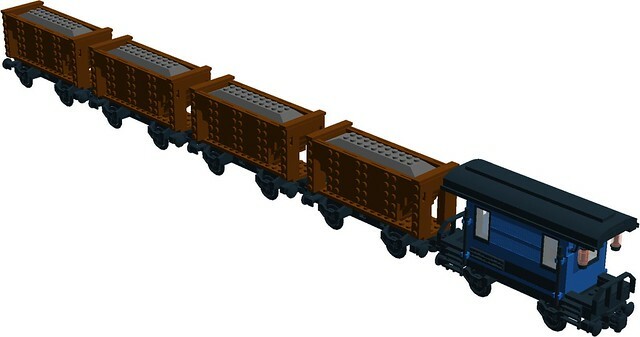 Might just have to look at building some hopper wagons like that, tho I'm thinking of doing something along the lines of a 6 wide, shortened wheelbase version of the BMR Hopper! Should present quite a task! Thanks for sharing your creations, your flickr page over the years has presented rather a lot of inspiration for me, before I even came to Eurobricks! I can't tell from these pics, but is the boiler centered on the loco? Another defining feature of a Shay was the offset boiler to accommodate the pistons. You might be able to use jumper tiles to get it slightly offset, though that might complicate the piston assembly and frame... Looks good though, the geared drive on the side is eye-catching. Good work! I believe the originals were narrow-gauge, but building one of these for 4-wide track is tricky (I've tried, it didn't get very far), so I'm not going to complain! I think I quite like the simplified design of the loco. However, the boiler should be off-centered to counter the weight of the cylinder block, as @CrispyBassist said and as Stephen's original is. 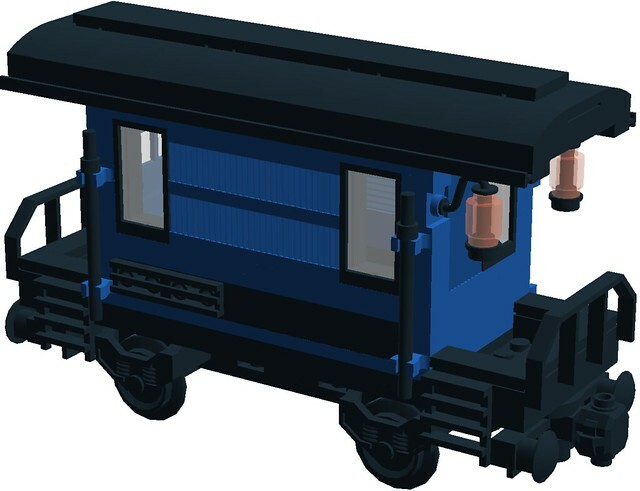 I think, given the 4-stud wide boiler on a 6-stud wide chassis just moving it over 1 stud would be fine, but I reckon Crispy's jumper plate suggestion would be fine too if you don't want to move it all the way over. A neat job overall, the hopper wagons look good together and the caboose tails it off nicely. Well done. Thanks @JEB314 (James), I really appreciate thew feedback. @CrispyBassist @ColletArrow I moved the boiler over one stud to the far side as you suggested, and I think it looks a lot better! I also added some mechanical details just in front of the pistons. Thanks for you help getting this model to perfection! Oh, and I think I'm gonna use Big Ben Bricks small flanged wheels for this loco, as without the friction bands it *should* ride smoother and get stuck less. I think they are slightly thinner though, so does anyone have a comparison shot of the two types (on-edge)? If anyone does have both types, I would really appreciate a picture or two! I like the idea of moving the bogies' pivot point over the articulated joint - this is a perfect transmission. Now that you moved the boiler aside, it is a perfect shay!!! Looks like it would be a fun build! Nice work! First post edited with the new pictures of the shay that I forgot to add last time. Thanks, but I didn't do the wheel design... I only did everything from the base up, plus the couplers and cowcatcher. Ok, I been mulling this over and I'm gonna use Big Ben Bricks small flanged wheels for this loco, as without the friction bands it *should* ride smoother and get stuck less. I think they are slightly thinner though, so does anyone have a comparison shot of the two types (on-edge)? If anyone does have both types, I would really appreciate a picture or two, please! Very impressive redesign ... I seen that you offset the boiler ... This was to keep the loco centered as all the valving was on the one side.